For that special sign that doesn't quite fit into one of the other areas on our site, we also offer a bespoke manufacturing service for signs. So if you need an irregularly shaped sign, we can work out a suitable material, and way of manufacturing it for you. The image to the right is of a design we were commissioned to design and manufacture for a local bike shop. The shop owns a vintage bike, and they wanted a sign to fit into the frame of the bike. So we made a template of the shape of the frame, and then proceeded onto a 2mm thick steel sign which was coloured to match the bike and then sign written with the customers Logo and details. 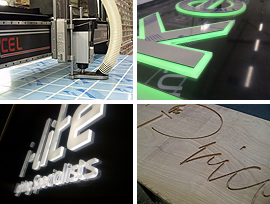 We now have limitless capabilities in serving the Sign and Display, Exhibition, and Point of Sale industries in completing large and small CNC work.